Nose: Pine and rye and some other sweet herbal, rooty notes. Some wood below that and also the brine I associate with the distillery. The wood gets stronger with time, but not offensively so. A few minutes later though the wood recedes and the herbal/rooty notes are gone; in their place is a very rich fruitiness: plums, hints of lime, brandied raisins. Wholly unexpected but very nice. The wood comes back but it’s toasted now and smeared with honey; some vanilla accompanies it. With a few drops of water the toasted wood and vanilla expand, and there might be some butterscotch too now; after a minute the lime and honey get much more pronounced as well. Palate: Hot. The wood and the fruit do battle and at first, at least, the wood seems to win; not decisively though. Some pepper as well. On the second sip there’s a distinct tropical accent to the fruit. On the third sip the fruit has outflanked the wood. This needs water though and hopefully it will bring those tropical notes out more strongly. Hmmm water certainly accentuates the lime but the tropical notes don’t expand very much. More vanilla sweetness though, and still some woody bite that gets stronger again. Finish: Medium. Somewhat indistinct at first but then some of the fruit hangs around. Some vanilla here too now. More citrus with water but not a whole lot of change. Comments: After an unpromising start the nose really blossomed. The palate didn’t quite match it, I’m afraid, even though it offered some teasing hints that it could. Just a bit too much wood on the palate. Very pleasant though, on the whole, and it’s possible that with more time and the right amount of water that tropical fruit could be coaxed out. If so, this would get a higher score. At any rate, I am now intrigued by the thought of older Pulteneys. Too bad there are so few of them out there and that the official ones cost so much. Nose: Not much of the piney/herbal/woody notes that I got on the first occasion–it moves much quicker to the honeyed fruit and is then consistent with the earlier review (except far less brine, if any). Palate: Less wood on the palate this time and it’s also not quite as hot two weeks later. Other than that this is pretty consistent with the first go around as well. Finish: More or less identical to the first time. Comments: This is a 6 oz sample that went into a 6 oz jar, so it’s not like it’s been exposed to a lot of air in the last two weeks, but perhaps the process of pouring into four jars (this was shared with two other friends and mine was the last jar filled) had some effect? Certainly, some of the rougher edges I got the first time have softened. Alas, the tropical fruit hints I got on the first go-around haven’t expanded so much as receded since then. On the whole, I’d give it a slightly higher score tonight. 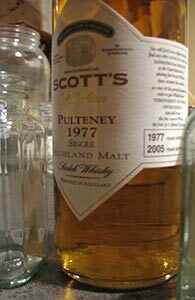 This entry was posted in -Whisky by Rating, 85-89 points, Old Pulteney, Scott's Selection, Whisky by Bottler. Bookmark the permalink. Our notes were much closer this time. And it seems as if a little bit of oxidation does open it up. One question. In the palate, I found a lot of tartness, while you found a lot of oak. Was the wood note you found buttery or toasty or bitter or literally wood pulp/bark? I’m going to take a look for it with my next glass of this stuff. I got a lot of oak the first time (from the fresh crack) but not very much last night. On the nose, on the first go around, it started out a little sharper but turned into toasted wood with vanilla/butterscotch; last night it just led with the fruit. On the palate the wood was a little too obtrusive the first time around but more in the background the second time. And I did get lime both times–I just didn’t note it as strongly because the wood was more prominent on the first occasion and on the second occasion I was only remarking significant differences (mostly the reduction in woodiness and heat). The blog is currently being inundated with spam, all of which is being focused on this post for some reason. In a doubtless futile attempt to plug this I am therefore temporarily turning off the comments on this post. I am sure this will have the effect of making my review of Glen Moray 12 or something else the next target but let’s see. Hopefully, the hosting company will block this traffic at a network level. I’m really tempted by both the Caol Ila and the Pulteney. I like both distilleries, I’ve never had whisky that old before, and I’m comfortable spending that much for the first time, next time I get a little windfall. I was born in 1978, so that 1977 Pulteney would be my first (and last?) chance to drink something that predates me. I wonder if MAO or anyone else would care to cast a vote on whether these—especially the Pulteney—is worth it. Thanks! Go for the Pulteney. When will you ever find another 70’s Pulteney? It would be great if MAO and Michael loved it, but maybe you will love it. (I have a bottle but haven’t opened it). Michael did love it, by the way, and I liked it a lot. $200 is not so much to pay these days for a 1970s vintage that is between “liked a lot” and “loved”, especially if the year is meaningful in some way. I assume a whisky no good unless I read gross overstatements with multiple exclamations marks. I’d say that given the extra value you place on the Pulteney it’s “worth it”. $200 is not so very much more than I paid for the bottle a few of us split and that was a couple of years ago. Without knowing the specifics of the other bottles I couldn’t say but if it’s the 1986 Highland Park I reviewed right before this Pulteney I would not pay $300 for it. I liked it a lot but for $300 there’s other things you could buy. Would you mind if I turned the general premise of your question into a separate post sometime next week? And MAO, I think that’d be great if did a topic on buying old bottles like these. Dare I ask, how much was this going for five years ago? At release? Five years ago you could probably have easily found it at $150 or below. I confess I do not know what the price was at release but based on old stickers I’ve seen on other Scott’s bottles released around that time I’d guess it was closer to $100 or even below. Consider that the Benromach 1978-1997 that I purchased a couple of years ago for not very much less than $200 had a sticker on it that read $85*. I purchased that one not because I thought it was going to be a classic but because it seemed like my last chance to try Benromach from that period—and, as it happens, I quite liked it. *In 2009 or so I’d purchased from the same store an OMC Brora 21, 1981 for $125 and in 2011 the Scott’s Port Ellen 1982-2003 for $175. The Brora was the last bottle—they had quite a few of the Port Ellens then—the price kept rising till they were gone. You know, we drinkers are always regretting not buying more of that rare stuff back in the day when it was cheaper, but I also wonder whether retailers ever regret letting things go for prices that today seem so low. The Whiskybase shop now has this for 425 Euro. I’ve tasked my younger brother with buying this for me at that mom & pop store (which is near his house) next time he can stop in. I lurved this stuff, and am kicking myself for not buying my own bottle of it at a mom & pop shop in AZ three years ago. It was $175. Hope the bottle you spied is awaiting you for the price you mentioned above. Yeah, this has all but disappeared from these parts. I went to the shop to buy it, but when I asked the “manager” about possibly cutting a break on the price if I bought both this AND the old Caol Ila, he claimed that they sold lots of them all the time and therefore had no need to offer a discount. This claim despite the dust, despite the shelf just as overflowing today as it was a year ago, and despite the explicit bottling date of 2005. If he just said, “sorry, we never do any discounts,” I woulda been mildly disappointed but I still woulda bought the Pulteney. But since he tried to sell me a load of BS, I got steamed and walked out there without spending a dime. Congratulations! In a fit of pique you left behind a bottle you really wanted! Now, to save face you have to send someone else to buy it for you—and that will only bolster the shop owner’s narrative that many people want these bottles! There is indeed a 17% chance that will happen.